What Does it Mean to be in Growth Mode? At New Breed, we often find ourselves uttering the term growth mode. We use it to reference a critical phase in a SaaS company's development in which inbound strategies and practices can serve as a growth accelerant. But the marketing industry is ripe with flashy labels and acronyms that can be disorienting if not furnished with meaning and context. And as much as we love using the latest lingo, we don't want to do so at the expense of integrity or clarity. Alas, here's our definition of growth mode and our guide for recognizing when you've reached it. Not to be confused with beast mode, growth model or Google's more left-field suggestion, Did you mean Growth Hormone?, the term growth mode (within the context of business and marketing) refers to companies that have bridged the gap between startup and scaleup and are taking definitive steps to expand their operation. While both startups and scaleups pursue growth in their own right, growth mode cites a specific type of development that only becomes pertinent in the scaleup phase. But before we delve more into what that phase entails, let’s dial it back to the beginning. In the last decade, shows like HBO's Silicon Valley have helped bring the startup into popular consciousness. The show's California namesake has become a tech mecca in its own right, but the cutthroat stakes, growing pains and grit that's amplified to a comical extent on series like Silicon Valley and Shark Tank have resonance beyond the boundaries of select U.S. cities. For over a century, the startup has been an emblem of the American free market and a driving motif in the American Dream. Like these shows illustrate, the startup phase is a vulnerable and sometimes chaotic period in a business's development that's laden with a unique sense of urgency and excitement. Startups are focused on achieving product-market fit and defining a scalable business model to simultaneously support and requisite growth. In short, they’re working through the trial-and-error phase of their development in which they’re attempting to define their audience, perfect their product, locate their niche and configure their operational and revenue model to form a positive trajectory. Companies in the startup phase may try out a few different product iterations or performance models on a small audience and pivot their growth strategy based on the results. Since startup teams are small and fundamental business elements are as yet undefined, pivoting at this stage doesn't carry the same inherent risks and consequences that it might later on. Startups aren't classified by a magic number of employees. In fact, teams can range in size from a couple of people to around twenty employees. Because the business does not yet have the revenue or long-term foresight to build out specialized departments, most startup employees are generalists who vacillate between several operational roles. At this stage, process is less important than experimentation, so teams often function in a more free-form way that only works in small groups. Since startups haven't quite figured out a reliable revenue model, they often kick off with seed funding and use their next investment surge (what's known as series A funding) to achieve a minimum viable product (MVP) that will allow them to progress on to the next development level. To have reached the scaleup phase is no small feat, but it's still a far cry from unequivocal success. On one hand, scaleups have achieved MVP and determined a sound business model that will allow them to continue to grow and prosper if certain conditions are met. In a sense, they've found the right equation for success, but may still be working to source the right resources to make it function. Why: Once you've progressed beyond the startup phase, building out a specialized marketing and sales force is seen as one of the next requisites to growth (and a critical element in the aforementioned success equation). In order to generate revenue to fuel further growth initiatives, it's vital that you have a team of individuals dedicated to attracting, engaging and closing more customers. At New Breed, we unite our marketing and sales teams under one masthead department:Revenue Operations. Since aligning these two teams is an essential condition of growth, scaleups should focus not only on hiring, but on establishing direct communication and a sound data-feedback loop between both team's activities. Why: As your customer base grows, having a team that's dedicated to customer satisfaction and quality assurance becomes critical to maintain the same level of service. In addition, a higher customer retention rate and Net Promoter Score (NPS) will fuel long-term business viability and revenue consistency. In order to evolve in tandem with customer needs and expectations as you scale, you need direct feedback from customers on how they're using your product and how you might improve it. Why: The urgency that companies experience in the startup phase doesn't dissipate when they achieve scaleup status. It's still important to move quickly, but doing so at scale requires a stable infrastructure. The more people that you add to your team, the more crucial organizational hierarchy becomes. In order to function and communicate effectively as your company grows, it's necessary to hire people who have experience managing big teams and aligning daily responsibilities with overhead company objectives. In addition to defining roles and hierarchies, delineating and documenting a clear, replicable processes is also part of establishing a stable infrastructure. While experimentation is an essential part of any startup's success, scaleups must become more risk averse in order to survive. At this point, they should have a solid understanding of what works for their business and what doesn't (courtesy of all their former business adventures and mishaps). Any experimentation that happens from here on out should be conducted within a more limited scope, with lower stakes. A scaleup's funding stage is usually into series B or later (depending on the specific product model and resources required) and investors may begin to limit any additional forward spending based on projected return. We've finally arrived back where we started. Once scaleups have begun to expand their operation, their focus should shift once again to growing their customer base and sustaining that growth trajectory over time. Growth mode refers to this unique period of action (scaling your operation) and strategic planning (expanding your perspective beyond short-term survival, and investing in long-term growth opportunities). When your company reaches growth mode, marketing can play a pivotal role in your ability to execute your next development push. 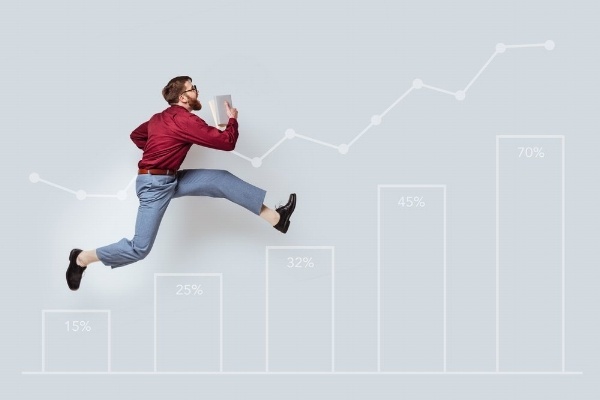 Apart from simply drawing qualified leads to your product or services, the right marketing platform and approach will give you the insight you need to take advantage of growth opportunities down the line and move the needle on key objectives with the least amount of risk and expense to your company. There's a reason why inbound marketing caters to SaaS companies in growth mode — and why inbound-savvy scaleups outperform and outpace their competition. In today's digital marketplace, your website is the crux of your brand and your roadmap to sustaining long-term growth. Give your SaaS company a jumpstart by learning how to apply inbound marketing strategies to generate leads and win customers at key junctures in your development journey. Download the free guide below to get started.